In our latest feature, we take a look at Texas Rangers pitching prospect Jake Brigham. Find out inside what big news he received from Rangers General Manager Jon Daniels this off-season. Also find out which amusing song Jake would use as an at-bat song if he currently had the chance. 2012 is poised to be a big year for both the Texas Rangers and right handed pitcher Jake Brigham. The past two seasons the Rangers have made it to the World Series but have come up just short. This offseason, Jake Brigham found out some big news in regards to how he may fit into the Rangers plans. This season he could make an impact on the Rangers drive to reach and finally win the World Series. In our feature on Jake Brigham we take a look back at the ups and the downs in his career and look ahead to what could turn out to be the most important year in Brigham’s young career. The Texas Rangers drafted Brigham out of Central Florida Christian Academy in the 6th round of the 2006 draft. As a senior he finished the regular season 7-2 with a 0.81 ERA and 110 strikeouts in 52 innings pitched. With numbers like these scouts armed with radar guns began to show up at his games. They liked what they saw, as the youngster had a live arm that could top 90 mph. The amazing thing about these numbers and all the attention, Brigham didn’t become a full-time pitcher for Central Florida Christian Academy until the beginning of his junior season. The Rangers liked what they saw and soon after the draft the right hander was lacing up his cleats and taking the mound as a member of the Rangers rookie team in the Arizona League. With the rookie Rangers Brigham saw most of his time as a starting pitcher. Appearing in 14 games the right hander started 11 games. In 58 total innings pitched, Brigham struck out 58 and finished the season with a 2-6 record and solid ERA of 3.70. With his first taste of professional baseball coming to a close 2007 would mark his first full season in baseball. For the 2007 season, Brigham found himself assigned to the Spokane Indians in the Northwest League. His stint in Spokane turned out to be a successful one as for the season Brigham finished with a 3.16 ERA and a 5-4 record. His strike out totals remained strong posting 65 swings and misses in 77 inning. For every break out season that gets a player noticed, many often have obstacles to over come. For Brigham his story is not different from many other pitchers chasing their dream to the majors. His entire 2008 season was wiped out by the three words no pitcher ever wants to hear, Tommy John Surgery. As a 19-year-old professional even finding out the news of surgery is hard to take, finding out you cannot pitch for a full season even harder. Through months of rehab, Brigham was able to mature and become more determined than ever to make his way back to the pitcher’s mound. After a total of 16 months of hard work Brigham found himself back on the mound as a member of the Rangers class A team, the Hickory Crawdads. With any pitcher coming back from such a major surgery it takes time for your strength and feel for pitching to come back 100 percent. In his first season back, Brigham threw 89 innings. Though he struggled from a numbers perspective with a 2-11 records and an ERA of 5.52 this was a step back in the right direction, a directions upward toward the major leagues. In 2010 the hurler was promoted to the Bakersfield Blaze of the California League. For those who are unaware the California League is not a friendly place for pitchers. The league is known as a hitter haven. The league sees more home runs hit out of its ballparks than any other in professional baseball. 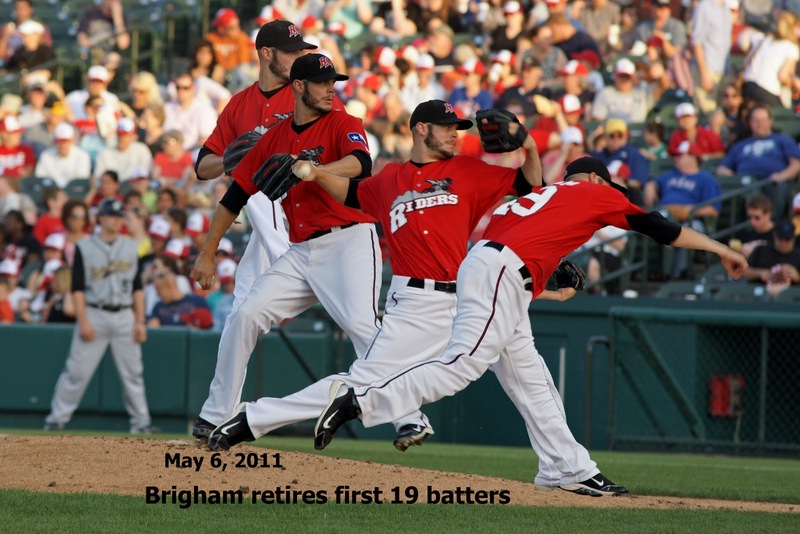 Brigham struggled with the Blaze going 1-5 with a 6.93 ERA in 10 starts before being sent back to the Hickory Crawdads. Brigham righted the ship and proved that he was ready to move to the next level. In 13 starts for the Crawdads he went 6-5 with an ERA back to pre-Tommy John surgery levels of 3.36. His strike outs continued to hover around his career averages as well between 7 or 8 per 9 innings. 2011 took a different path for the right hander. Instead of returning up a level and back to the California League the Rangers had other plans and promoted him all the way up to the class AA level. 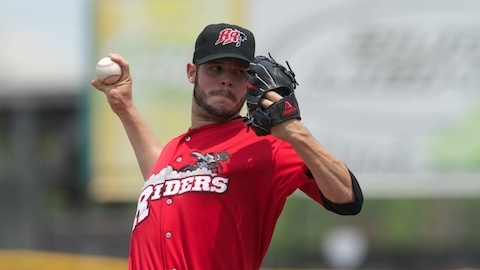 As a member of the Frisco Roughriders, Brigham started the season in the starting rotation. He started in 14 games before the Rangers transitioned him from starter to relief pitcher. Brigham was slow to adjust, struggling in his first few outings out of the bullpen. Once he adjusted to getting ready sooner, Brigham kicked it in to high gear. In his final 38.1 innings of relief he posted a 2.35 era and dominated with 45 strikeouts. Currently, the right hander features a four pitch mix. His fastball is his top pitch, as a starter it ranged 91 – 94 mph but can reach 97 out of the bullpen. Brigham also features a slider, change, and a curveball with a big downward break to it. With the book closed on 2011 and a new one opening on 2012, Brigham got some exciting news. In November he received a call from Texas Rangers General Manager Jon Daniels. The reason for the call? Daniels wanted to inform him that the Texas Rangers were adding him to the 40 man roster. On November 18, that news was announced to the public. For Brigham the news is big, as it shows him that the Rangers have faith and believe that he is close to making the next step to the major leagues. As we come close to reporting days for pitchers and catchers make no mistake, Brigham is determined to succeed. Could 2012 be the year that Brigham puts on the Rangers uniform and makes his debut in front of a full house at Arlington Stadium? Only time and Brigham’s on field performance will determine that. We plan on covering Brigham every step of the way in 2012 and if he makes his debut we definitely plan on covering it. You can follow Jake every step of the way too on twitter. You can find him at @JBrigham49 and you can find us on twitter as well at @CTD_Sypien. What was the draft experience like for you? The draft experience was exciting being an 18-year-old kid, having scouts come to every game, into your home. It was very exciting and a lot of fun. You have battled through some injuries and surgery in your career; explain what that process was like and how hard it is to rehab your injuries to try to get back on the field? Finding out that I had to have Tommy john surgery was devastating as a 19-year-old kid. To know that I wouldn’t be able to pitch and do what I love for over a year was not fun at all. It was a long process (16 months before I pitched in a game.) It was a lot of hard work, patience, and rehabbing with Texas was very good, they have one of the best rehab teams and medical staff in the game. You have mostly been a starter in your career up until last year when you saw some time out of the bullpen. Do you prefer starting or relieving and what role do you expect to be in during the 2012 season? I just love pitching, as a starter there is more routine involved preparation where as reliever you have to be able to be flexible, and be ready every night for your name to be called. I enjoyed both roles. As for 2012 I’m going into camp to work hard and wherever they assign me I’ll pitch my best in that role. What coach/instructor has influenced/taught you the most in your pro-career? There has been many different coaches that have spent countless hours working with me, talking with me, and strategizing with me. To name a few would be my low A coach -Brad Holman, AA Jeff Andrews, and our pitching advisor-Mark Connors. They have all been hugely invested in my career, and there are many others as well. Who has been the toughest hitter you have had to face so far in your pro-career? I would have to say Mike Trout with the Angels. He is very disciplined hitter, hits to all parts of the field, and he is a tough out. Every player faces ups and downs during their career, at this point in your career what has been your biggest up and down? Coming back from Tommy John was an uphill battle even after being healthy was a difficult season, mentally. Trying to come back from an injury and develop, as pitcher was a difficult thing for me that I had to overcome. One of the top points in my career was this past off-season getting a phone call from Jon Daniels telling me that I was placed on the Texas Rangers 40-man roster. Incredible feeling. What are your goals heading into 2012? My goal is to make it to the big leagues, and stay there. The goals in order to obtain that would be filling the strike zone up with all 4 of my pitches. Who was your favorite baseball player growing up? Favorite non-baseball athlete? NOMAR WAS THE MAN! As a little leaguer I tried to mimic him at the plate. Non-baseball athlete would have to be John Lynch, safety for the Tampa Bay Bucs, loved how hard he used to hit people, and how passionate he was for the game. He was also a great leader on and off the field. Whats in your DVD/Blu Ray player right now? If you were to get a chance to make a big league at bat (even tho you currently play for an American league team) what song would you choose at this time to be your walk up to the plate music? A very special thanks to Jake and Taylor for providing some of the pictures for the story, If you are the photographer of these pictures please send me a message and I will gladly provide you credit for your great work. (Check out this unique photo below from his May 6, 2011 performance) Lastly Jake thank you for taking time out to sit down and answer some questions as your road the majors continues. We look forward to following him during the 2012 season. Please follow Jake at @JBrigham49 on Twitter to follow his progression in 2012.